FullForce EPDM is the only EPDM membrane to feature a factory-applied adhesive across its entire surface. 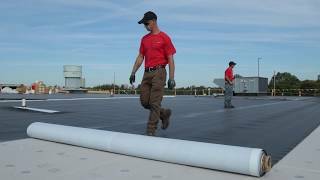 Without the need for seam tape, adhesives or waiting, it installs 4.6x faster than standard EPDM membrane* including seams. When you Go FullForce, you can get more squares installed in a day. 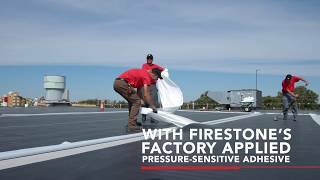 Firestone's Secure Bond™ Technology ensures exceptionally strong adhesion coverage across the entire membrane- from seam to seam. Relieves the need for tape and adhesive flash-off time, making approved details significantly quicker to install. 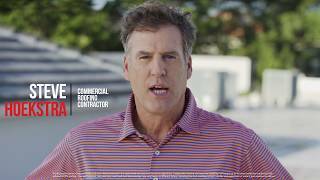 Creates a strong bond even in cold temperatures so you can add more roofing days to your year. Compliant with all state VOC regulations and safe for contractors, building occupants and the environment. Engineered to withstand well over 180 pounds per square foot in wind uplift pressure, achieveing an FM-780 certification.